A good book teaches kids about taking risks and trying new things. Over the past several years, social media, education blogs, and state education policies have been increasingly discussing STEM (Science, Technology, Engineering, and Math) topics. Today, even preschool and kindergarten teachers are required to incorporate these subjects into their programs. This isn’t really anything new; it’s more of a matter of being mindful of these skills as we connect with our children while they are playing. Researchers, educators, and school districts have also realized that the creative skills in art and design help children learn to innovate. Thus, the STEM acronym has been expanded to become STEAM: Science, Technology, Engineering, Arts, and Mathematics. STEAM skills are as important as learning letters, sounds, colors, shapes, and numbers for school readiness. The question is how can we as parents incorporate activities that help children build these skills into our already busy routines? One way to introduce STEAM learning is through literature. Everyone loves a good book, especially young children. As they are guided through the storytelling experience, children learn to recognize patterns in language, play and manipulate words, and acquire phonetic awareness. Stories also help children learn about taking risks and trying new things. The characters give children a framework to explore how things work and the world beyond their home. The books you select should include both fiction and non-fiction that cover a variety of interests, topics, and characters. This wonderful story helps children learn about nature, how dirt and sand can create an island, and how machines work, all while following Curious George on another adventure. This eBook is available in the Curious World app - sign up today with code CW_20 for 20% off your first year! Charlotte uses the scientific method to solve a family problem. 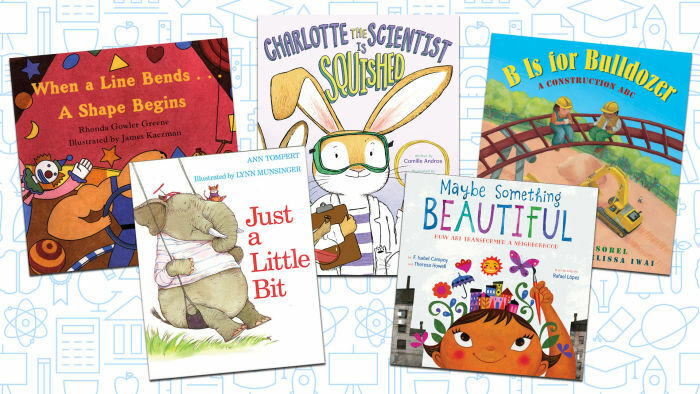 With Charlotte as their guide, children learn the basics of inquiry, testing, prediction, and more. Mike and his wonderful bulldozer named Mary Anne help children explore engineering concepts behind building tunnels, skyscrapers, and deep canals. Photography books like this one are perfect for providing children with images and stories about the natural world around them. Your child can practice the alphabet and learn about the details of constructing a family park. Learn about the different types of train and their parts, and appreciate the beauty behind the vehicles we see every day.This eBook is available in the Curious World app - sign up today with code CW_20 for 20% off your first year! This is a story about creativity, technology, innovation, and perseverance. A little girl tinkers and tests and creates again in a book full of humor and fun! Children learn all about animals and the unique things their tails, mouths, noses, ears, and eyes can do. This engaging rhyming story invites children to get creative while building a knowledge of shapes to construct a variety of interesting designs. A very funny story about an elephant and a mouse on a seesaw. Children learn to experiment with balance, estimation, and movement.